The 88 Project, August 22, 2018: Nguyen Tin, born in 1990 in Can Tho province, is a singer based in Saigon. Because of his participation in peaceful demonstrations, his support for families of political prisoners, and his covers of many Bolero romantic songs, which were censored harshly by the communist authorities after 1975, Nguyen Tin has been on the police watch list. On June 15, he was detained for three days after taking part in a demonstration in Ho Chi Minh City on June 10 against proposed laws on Special Economic Zones and Cyber Security. Since being released, he has been continually harassed and threatened, and his livelihood has been disrupted as the authorities prevent live music clubs from hiring him. On August 15, his mini-show at Casanova Cafe in Ho Chi Minh City, Sai Gon Ky Niem (Memory of Saigon), was raided and broken up by a large number of police officers. Nguyen Tin and other participants, including prominent journalist and writer Pham Doan Trang, engineer Nguyen Dai, and many other guests, were severely beaten right at the cafe. Preventing Nguyen Tin from singing apolitical love songs composed before 1975 and attacking activists, especially Pham Doan Trang, were believed to be the main purposes for this crackdown. According to Nguyen Lan Thang, one of the invitees present at the concert, Memory of Saigon was organized for a limited number of guests by some friends of Nguyen Tin, led by Nguyen Dai and Pham Doan Trang. Only a small group of trusted people who follow and support the democratic cause was invited to join. To ensure confidentiality and safety, the venue of the concert was only revealed to the selected guests at the last minute, which made surveillance by authorities in Ho Chi Minh City difficult. The authorities watched Nguyen Dai for many days but failed to find out the show’s venue in advance. The only information they got was the invitation to the concert because of its publicity. Unfortunately, by following some invited guests, they finally got the address on the day of the show. Nguyen Tin told the BBC that after he performed seven or eight songs, the police force of Ward 7, District 3 and an interdepartmental examination delegation of information and culture (the “examination delegation”) stormed into the cafe and asked for the concert license. Nguyen Tin kept singing despite knowing that dozens of police, vigilantes, and security men in both uniforms and plain clothes were surrounding the coffee shop. Around 9:30 pm, Nguyen Tin had to apologize to around 80 music showgoers for having to reluctantly halt his show. Pressure from police on Casanova’s owner forced Nguyen Tin’s live show to end earlier than scheduled. After that, the police locked the door of the cafe and asked to examine the audience’s ID cards. Some women were released while the rest were still confined in the cafe. Activist Duong Dai Trieu Lam recounted that the police were crowding outside, with three to four specialty vehicles arriving by 10:20 pm. Arrests started and police attacked many activists and guests. Meanwhile, Nguyen Tin was working with the examination delegation inside and was fined for the alleged lack of a performance license, lack of copyright permission, and performing songs that have not been allowed to circulate. Police also confiscated his phone and wallet, which included his important documents such as driver’s license and ID card. He was questioned as to who organized this event and beaten for an hour before being brought into a seven-seat car with his hands cuffed. 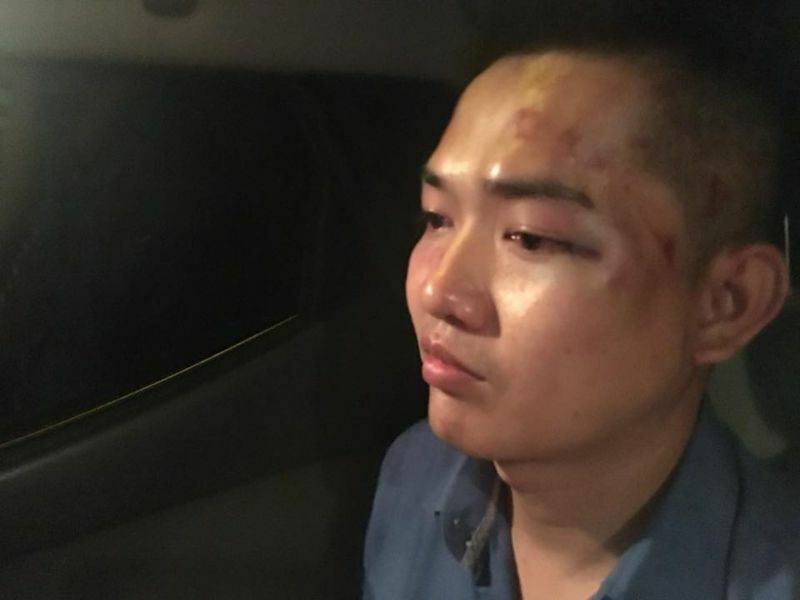 Nguyen Dai, one of the organizers, was also beaten and put in the same car as Nguyen Tin. Both of them were blindfolded and hooded with their hands cuffed. The police drove about 60 km and stopped at a rubber forest in Cu Chi district, where police pushed Nguyen Tin out and left him there. The car drove on for 15 minutes more, at which point the police dragged Nguyen Dai out and left him in the forest without any money or documents. Tin and Dai managed to find their way home while coping with their injuries. Duong Dai Trieu Lam stated that he and others picked Nguyen Tin up at 2:30 am in Tan An Hoi commune, Cu Chi district, while Nguyen Dai arrived home at 6:20 am. Dinh Nhat Uy reported that police also arrested many other activists, including Nguyen Tien Trung, Nguyen Lan Thang, Huynh Phuong Ngoc, Ta Quang Linh, Tran Minh Khanh, Huynh Thanh Phat, and many others, and moved them to the police station of District 3. Among them, Pham Doan Trang was assaulted the most brutally. Witnesses saw the police hit Pham Doan Trang in the face and belly so harshly that her face was disfigured. According to activist Trinh Huu Long, Trang was beaten many times during the questioning session in the police station of Ward 7, District 3. At the end of the interrogation, the police called a doctor to check her health and concluded that it was only soft tissue injuries and that they would not be dangerous. However, Trang believed that it was a police officer disguising herself as doctor, as that person did not sound like a normal and knowledgeable doctor and was mainly trying to touch Trang’s body as if to find something, which could be Trang’s phone. The police also confiscated her laptop, ATM card, ID card, and money, as they did with Nguyen Tin and Nguyen Dai. On the way to bring her back home by taxi, they dropped her off in the middle of the trip and continued to beat her brutally with a helmet, making her head bleed and breaking the helmet into pieces. Trang was in serious condition when she was brought to the hospital, where she was diagnosed with a brain concussion because of these assaults. On August 22, she first shared her story on her Facebook, after many days in the emergency room in the hospital, where security forces always kept an eye on her and her visitors. Pretending to be doctors and calling for Trang’s family, the police identified her visitors and harassed them in many ways, including physical assault and continuous surveillance. The 88 Project considers this crackdown on Nguyen Tin’s show a blatant violation of the rights to artistic freedom, freedom of expression, and security of the person. In particular, the brutal assaults on Pham Doan Trang, Nguyen Tin, Nguyen Dai, and their friends by the authorities amount to the use of torture, which is absolutely prohibited by international law. This intervention against a show of a purely private and cultural nature, as well as the physical attacks on its participants, are a continuation of a worrisome trend of violence committed by the authorities against peaceful activists in recent years and which, this year, has devolved into outright terrorizing of activists in broad daylight in public spaces. We remain particularly concerned about the health situation of writer Pham Doan Trang and the continuous surveillance against her by the local police. The international community must condemn this concerted practice of violence by the Vietnamese government and hold the government accountable for its violations of international law, as well as take prompt actions to demand the government end the persecution of Pham Doan Trang and her friends.